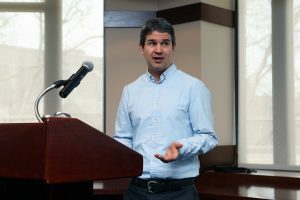 Six distinguished faculty members were honored on March 13 for their achievements in securing externally funded research grants at the third annual Sponsored Research Day on the Rose Hill campus. The University Research Council and Office of Research presented the Outstanding Externally Funded Research Awards (OEFRA) to recognize the high quality and impact of the honorees’ sponsored research within the last three years and how their work has enhanced Fordham’s reputation—both nationally and globally. Faculty were honored in five separate categories and were given awards by Jonathan Crystal, Ph.D., interim provost, associate vice president, and associate chief academic officer. 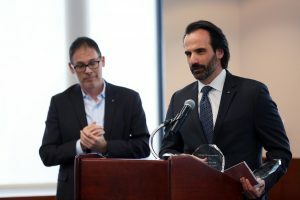 George Demacopoulos, left, and Aristotle Papanikolaou, right, shared the award for the Humanities category. Demacopoulos and Papanikolaou, co-directors of Fordham’s Orthodox Christian Studies Center, shared the award for the Humanities category. Demacopoulos has received awards totaling $928,000 in the past three years, while Papanikolaou has received a total of $888,000. Last April, they secured two grants totaling $610,000 that will be used to fund a multiyear research project devoted toward the issue of human rights. Interdisciplinary Research: Su-Je Cho, Ph.D., Associate Professor of Childhood Special Education at the Graduate School of Education. Su-Je Cho, was honored for receiving two external grants totaling more than $2.7 million in the past three years. 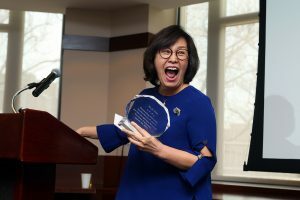 Cho, an expert in the field of special education, has received two external grants totaling more than $2.7 million from the U.S. Department of Education and other foundations in the past three years. Her interdisciplinary project will produce approximately 40 professionals in special education and school psychology, which are the greatest shortage areas in the field of education. Gribetz has received six external grants totaling $55,000 from the prestigious National Endowment for Humanities and other foundations in the past three years. Her research focuses on the history of time in antiquity and the important role that religious traditions and practices have played in the history of time. In 2017, she received the Manfred Lautenschlaeger Award for Theological Promise, alongside nine other young scholars, from the University of Heidelberg in Germany. Franks has received five grants totaling more than $5.3 million from the National Science Foundation in the past three years. The results of the studies funded by these grants have been published in 17 peer-reviewed scientific publications since 2016. The papers, which are in high impact journals such as Evolution, Molecular Ecology, and American Journal of Botany, have been widely cited. His work has helped to advance our understanding of responses of plant populations to climate change and the genetic basis of these responses. Steven Franks won for the sciences category. 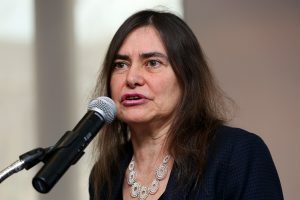 Heyman, who is also director of Fordham’s Children & Families Institute center, has received 10 grants totaling more than $3 million from a variety of external foundations in the past three years. Last year, she co-edited, along with Graduate School of Social Service Associate Dean Elaine Congress, D.S.W, Health and Social Work: Practice, Policy and Research (Springer, 2018). 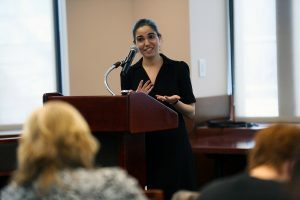 She has taught social work research, advanced research, and social welfare policy courses in Fordham’s master of social work program, as well as policy implementation in the doctoral social work program. Janna Heyman won for the social sciences category. Organized by the Office of Research and the University Research Council and sponsored by the University Research Compliance Council and the Office of Sponsored Programs, the daylong event featuring a keynote speech by Denise Clark, Ph.D., Associate Vice President for Research Administration, University of Maryland at College Park. A forum of science researchers featured Thomas Daniels, Ph.D., director of the Louis Calder Center, Deborah Denno, Ph.D, director of the Neuroscience and Law Center, Silvia Finnemann, Ph.D., director of the Center for Cancer, Genetic Diseases, and Gene Regulation, J.D. Lewis, director of the Urban Ecology Center, Amy Roy, Ph.D., director of the Pediatric Emotion Regulation Lab, and Falguni Sen, Ph.D., director of the Global Healthcare Innovation Management Center.